Background: Sleep fragmentation, repetitive hypoxemia during sleep, excessive sleepiness during the day, lack of concentration, memory loss, depression, decreased libido, and impotence are the characteristics of obstructive sleep apnea syndrome (OSAS) that may impair quality of life (QOL). This study aimed to investigate the QOL and factors that may affect QOL in people with different OSAS severity and without sleep apnea. Methods: This was an analytical cross-sectional study. Polysomnography was performed on 200 people. Those detected as having nonapnea and mild-moderate-severe OSAS were administered the Epworth sleepiness scale, Beck Depression Inventory, and the World Health Organization Quality of Life-BREF (WHOQOL-BREF) scale. Results: According to the apnea-hypopnea index, 36 people (18.0%) were in the nonapnea-hypopnea group, 28 (14.0%) in the mild OSAS group, 63 (31.5%) in the moderate OSAS group, and 73 people (36.5%) were in the severe OSAS group. Depression was present in 31 people (15.5%) who participated in the study. The nonapnea-hypopnea group comprised 12.9% of those with depression, mild OSAS group comprised 16.1%, moderate OSAS group comprised 22.6%, and severe OSAS group had 48.4% of the depressed subjects. Beck depression scores showed a significant positive correlation with the Epworth scale (t< 90% SaO2) (r = 0.285, P< 0.001 and r = 0.283, P< 0.001, respectively). The mean scores of WHOQOL-BREF subgroups' physical health (P < 0.001), psychological health (P < 0.001), social relations (P < 0.001), and the environmental area (P < 0.001) in those with depression were statistically significantly lower than those without depression. QOL was significantly associated with the presence of OSAS (P = 0.008). Conclusion: Decreased deep sleep duration, increased arousal index, and a high ratio of sleep duration with oxygen saturation below 90% to the duration of the entire sleep period increase daytime sleepiness and depressive symptoms in those with OSAS; thus, disrupting general health and QOL. Background: Treatment of cervical spine injury is the most challenging of all the injuries of the spine, and there is yet no agreement on the best method of care. Objective: We studied the complications and outcome of two skull traction devices used to treat cases of cervical spine injury in three centers in Enugu, South East Nigeria. Patients and Methods: A retrospective analysis of patients with cervical spine injury managed with skull traction as the definitive treatment using either Crutchfield or Gardner-Wells tongs over a 5-year period (April 2008–March 2013). The traction was applied for 6 weeks, and the patient was subsequently mobilized with either hard cervical collar or Minerva jacket for another 6 weeks. Results: One hundred and five patients with complete records out of 127 cervical spinal injured patients treated were studied. Forty-one had the American Spinal Injury Association (ASIA) Grade A whereas 64 had incomplete cord injury of ASIA Grades B–E. Forty-eight had Crutchfield traction whereas 57 had Gardner-Wells traction. At the end of treatment, no patient improved among those with ASIA Grades A and B. All the 12 cases of mortality were recorded as well among ASIA A (n = 9) and B (n = 3) Grades. Over 50% of ASIA Grades C and D patients improved to Grade E. The complication profile varied significantly between the traction subgroups with those treated using Crutchfield tongs experiencing more events (χ2 = 6.5, df = 1, P< 0.05). However, there was no significant statistical difference in the Association Impairment Scale (AIS) outcome (P = 0.55) as well as mortality rates (χ2 = 0.97, DF = 1, P> 0.05) between those treated with Crutchfield and Gardner-Well traction. Conclusion: Crutch field tong traction may be associated with more complications when compared with Gardner-Wells traction. However, from our study, the final American Spinal Injury AIS outcome, as well as the overall mortality rates associated with the two traction techniques, did not vary significantly. Objectives: The aim of the present study was to compare two different bond strength test methods (tensile and microtensile) in investing the influence of erbium, chromium: yttrium-scandium-gallium-garnet (Er, Cr: YSGG) laser pulse frequency on resin-enamel bonding. Materials and Methods: One-hundred and twenty-five bovine incisors were used in the present study. Two test methods were used: Tensile bond strength (TBS; n = 20) and micro-TBS (μTBS; n = 5). Those two groups were further split into three subgroups according to Er, Cr: YSGG laser frequency (20, 35, and 50 Hz). Following adhesive procedures, microhybrid composite was placed in a custom-made bonding jig for TBS testing and incrementally for μTBS testing. TBS and μTBS tests were carried out using a universal testing machine and a microtensile tester, respectively. Results: Analysis of TBS results showed that means were not significantly different. For μTBS, the Laser-50 Hz group showed the highest bond strength (P < 0.05), and increasing frequency significantly increased bond strength (P < 0.05). Comparing the two tests, the μTBS results showed higher means and lower standard deviations. Conclusion: It was demonstrated that increasing μTBS pulse frequency significantly improved immediate bond strength while TBS showed no significant effect. It can, therefore, be concluded that test method may play a significant role in determining optimum laser parameters for resin bonding. Background: The need for nonobstetric abdominal surgical interventions in pregnant females arises periodically in practice and can be a source for concern for both the patient and the surgeon because of the risk of adverse outcome. Aims and Objectives: To determine the indications for, and assess maternal and fetal outcome following nonobstetric abdominal surgeries in Jos University Teaching Hospital. Materials and Methods: This was a retrospective cross-sectional study analyzing clinical records of pregnant women, who had nonobstetric abdominal surgeries in Jos University Teaching Hospital between January 2007 and December 2011. Results: Fifty patients had nonobstetric abdominal surgery during the study period (January 2007 to December 2011). The ages of the women ranged 15–49 years with a mean of 29 ± 8.13 years. Intraoperative findings in the patients were consistent with acute appendicitis in 43 (86%) patients, two patients (4%) had ruptured spleen while one patient each (2.0%) had a transverse colon injury, postoperative adhesion bands, ruptured uterus and urinary bladder, and mesenteric injury. One (2.0%) mother died after surgery. 38 (76%) had spontaneous deliveries, and there were 11 miscarriages (22%) and 1 perinatal death. The perinatal mortality rate was 0.093/1000 deliveries. The mean hospital stay was 5.52 days. Conclusion: Nonobstetric abdominal surgeries in pregnant women are an infrequent occurrence at Jos University Teaching Hospital but when they do occur, they are indicated by acute appendicitis in pregnancy. Context: Posttraumatic stress disorder (PTSD) is the most common consequence of traumatic experiences. The North Central Nigeria to which Plateau State belongs has witnessed many ethno-religious crises. While previous studies suggested a high prevalence of PTSD among students, to the best of our knowledge, no such study has been reported in Nigeria. Aims: The study aimed to determine the prevalence and correlates of PTSD among medical students in a university. Materials and Methods: Cross-sectional systematic random sampling was used to select 200 medical students. A two staged interview with questionnaire on sociodemographic variables, PTSD Checklist-Civilian Version, Impact of Event Scale, and Composite International Diagnostic Interview was carried out. Statistical Analysis Used: SPSS Inc. Released 2007. SPSS for Windows, version 16.0. Chicago, SPSS Inc. was used for statistical analysis. Results: Prevalence of PTSD among the students was 23.5%. Previous childhood trauma and personal experiences during the crisis were significantly associated with having PTSD. Conclusions: High prevalence rate of PTSD among medical students in Jos is an indicator of psychological consequences of the recurring crises on the inhabitants. There is a need for follow-up and counseling/trauma healing for those identified. Aim: To evaluate catalase (CAT, EC 1.11.1.6) activity in healthy and inflamed dental pulp of young patient's teeth and to investigate if an active defense system oxidizing agents is present as a response to bacterial invasion. Materials and Methods: Twenty young patients between 15 and 25 ages, who were diagnosed to be healthy, were the source of the pulp tissue. The situation of the dental pulps was evaluated using clinical and radiographic assessments. The patients were divided two groups from healthy, and inflamed pulp tissues were obtained; each participant provided one pulp tissue specimens. The specimens were collected during endodontic treatment or by longitudinally grooving and splitting the teeth (if extracted). Catalase activity was determined through spectrophotometric methods and an independent sample t-test assessed the significance of differences between the groups. Results: There was statistically a difference between healthy pulp tissue and inflamed pulp tissue (P < 0.005, independent sample t-test). The catalase activity of healthy group was significantly lower than inflamed pulp groups. Conclusion: The present study has shown that a significant increase in catalase activity is determined in inflamed dental pulps, which is due to pulpitis in comparison to healthy dental pulp. Context: Methadone maintenance is a standard treatment for opiate-dependent individuals. However, deficits in cognitive functioning have been associated with this treatment. Aim: This study aimed to determine the dose and treatment duration-related effects of methadone on executive functions. Setting and Design: Pure male opioid users with no considerable history of other drug abuse, undergoing methadone maintenance treatment (MMT) were recruited from a major government-run de-addiction center. Methods: Hot executive functions including decision-making and emotion recognition were assessed using the Iowa gambling task and Ekman faces test, whereas cold executive functions including working memory (WM), cognitive flexibility, and response inhibition were assessed using n-back, Wisconsin card sorting test, and the GO/NOGO task, respectively. Statistical Analyses Used: Descriptive statistics, Pearson's correlation coefficients, and multiple regression analysis were used to test the hypotheses of the study. Results: Methadone dose and length of MMT were found to be associated with greater impairment in executive functions. Impairment in cognitive performance was also found to be inversely related to time since dosing. Regression analyses revealed that methadone dosage and time since dosing accounted for a significant proportion of the variance in cognitive flexibility, while the total amount of methadone administered was able to predict deficits in WM, methadone treatment duration predicted psychomotor speed, and time since dosing predicted decision-making ability. Conclusions: To keep cognitive impairment at a minimum, methadone dose and treatment duration will have to be customized considering the history of opiate abuse so that impairment attributable to long-term opiate use may be differentiated from acute methadone dosing. Objective: This study aimed to compare the QT interval changes in women with term pregnancy living at moderately high altitude (1890 m in Erzurum, Turkey) with those of women living at sea level (31 m in İstanbul, Turkey). Materials and Methods: One-hundred ten women (n = 55, for each group) with full-term and single child pregnancies. Two different locations in that state were selected: İstanbul, Turkey, which is at 31 m above sea level (Group 1) and Erzurum, Turkey, at 1890 m above sea level (Group 2). Physicians from the two locations participated in the study. We estimated QTc, QTc Max, QTc Min, QT, and QTcd intervals. Results: Moderately high altitude group had significantly longer QT parameters (QTc, QTc Max, QTc Min, QT, and QTcd intervals) compared with sea level group (P < 0.01, for all). Conclusions: According to our results, QT interval changes occur in term pregnant women living moderately high altitude. These changes may be associated with pregnancy-related cardiovascular complications in moderately high altitude. Background and Aims: Surgical removal of impacted teeth is a common operation in oral surgery. Thus, pathological potential of impacted third molars is extensively studied. However, many of those studies based on data collected from analysis of radiographs only. The purpose of this retrospective study was to compare the follicles of symptomatic and asymptomatic impacted third molars histopathologically for a number of characteristics. Materials and Methods: Records of the patients who had been previously operated for impacted third molars were reviewed. Eighty-three patients were selected and divided into two groups, clinically symptomatic and clinically asymptomatic. None of the patients had a radiographic pericoronal radiolucency of wider than 2.5 mm. Histopathological samples of the patients were obtained and re-examined by two pathologists. Two groups were statistically compared for 12 histological parameters. Results: Eleven of the 12 parameters had statistically significant differences (P < 0.05), whereas one parameter (odontogenic remnants) was found not to be significantly different between the groups. Conclusion: A delay in impacted third molar surgery can lead to further pathological changes in dental follicles and can increase severity of the inflammation. Moreover, dimensions of the pericoronal radiolucency may not provide a correct interpretation of the pathological changes in the region. Introduction: Patient relatives are a significant part of the health care team in any hospital setting. This study determines their knowledge, perceptions, and factors responsible for their exposure to health hazards at the Ahmadu Bello University Teaching Hospital (ABUTH), Zaria, Kaduna State. The outcome of this study is intended to help the hospital managers to have a reference to make plans for the patient relatives' welfare and also address the ethical issues regarding patients' relatives safety while in the hospital. 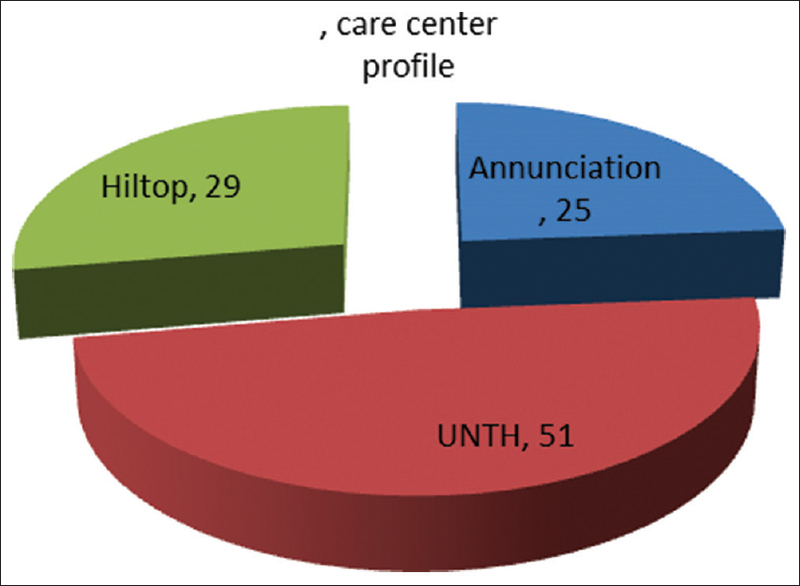 Materials and Methods: This is a cross-sectional descriptive study involving 100 participants selected by systematic random sampling technique from the ten admission wards of the ABUTH. The data were analyzed using the Statistical Package for Social Sciences IBM 20 and STATA SE12. Results: The mean age of the respondents was 35 years. They were mainly Hausa (58%), female (79%), and Muslims (76%). About 21%, 25%, and 54% of the respondents have poor, fair, and good knowledge, respectively, with a mean knowledge score of 33.3% while 24% perceived that blood urine and feces from patient relatives are safe to handle. Sexual harassment (13.3%), abusive insults from health care workers, (13.3%) and aggression from other patients were reported. Being the sole caregiver, type of illness, handling of patients' blood and feces, and length of hospital stay were significantly associated with exposure to hospital hazards (P < 0.05, χ2 > 1, odds ratio >1). Conclusion: The participants' knowledge and perception of hospital hazard were poor. Abusive insults by health workers, sexual harassment, and indiscriminate handling of patients' specimen constitute major ethical challenges in this setting. The hospital management should have a guideline specifying the roles and responsibilities of patients and their relatives. There is a need for the health care workers' ethics education and safe accommodation for patient relatives. Aim: This study aimed to investigate maternal and fetal Doppler flow parameters in term pregnant women diagnosed with fear of childbirth (FOC). Materials and Methods: Women between 20 and 40 years with full-term singleton pregnancies (≥37 gestational weeks) were included in the study. All patients were questioned with Turkish form of Wijma Delivery Expectancy/Experience Questionnaire (W-DEQ) version A. Women with W-DEQ scores ≥85 were defined as FOC. Forty women diagnosed with FOC (FOC group) and 45 women with W-DEQ scores <85 (control group) underwent Doppler waveform analysis and the pulsatility index (PI) and resistance index (RI) values for uterine, umbilical, and mid cerebral arteries were recorded. Results: Both groups had similar PI and RI values for umbilical and mid cerebral arteries (P > 0.05). However, PI and RI values for both right and left uterine arteries were higher in FOC group than control group (P < 0.05, for right uterine artery PI; P< 0.001, for left uterine artery RI; and P< 0.01, for others). Conclusion: It may be suggested that the presence of FOC in term pregnant women seems to have a negative effect on uterine blood flow parameters. When diagnosed with FOC, the women should be referred to a specialist for psychoeducation and psychosomatic support to decrease her fear and to minimize the negative impact of fear on the fetus. Background and Purpose: The purpose of this study was to evaluate the internal and marginal fit of chrome cobalt (Co-Cr) crowns were fabricated with laser sintering, computer-aided design (CAD) and computer-aided manufacturing, and conventional methods. Materials and Methods: Polyamide master and working models were designed and fabricated. 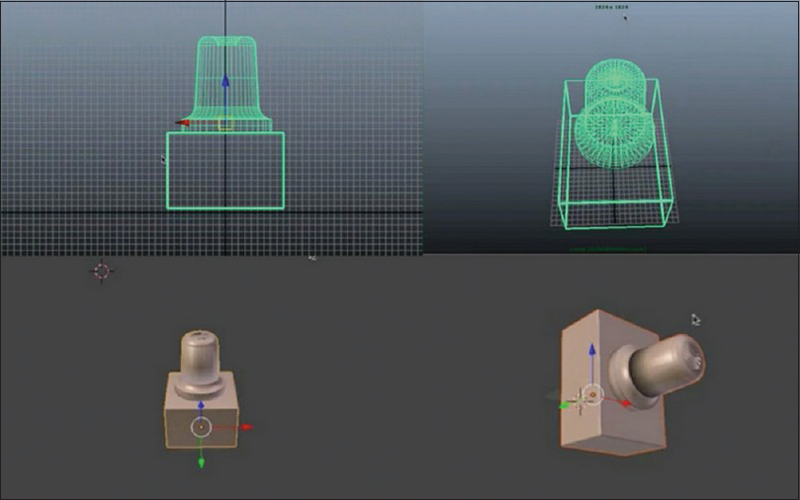 The models were initially designed with a software application for three-dimensional (3D) CAD (Maya, Autodesk Inc.). All models were fabricated models were produced by a 3D printer (EOSINT P380 SLS, EOS). 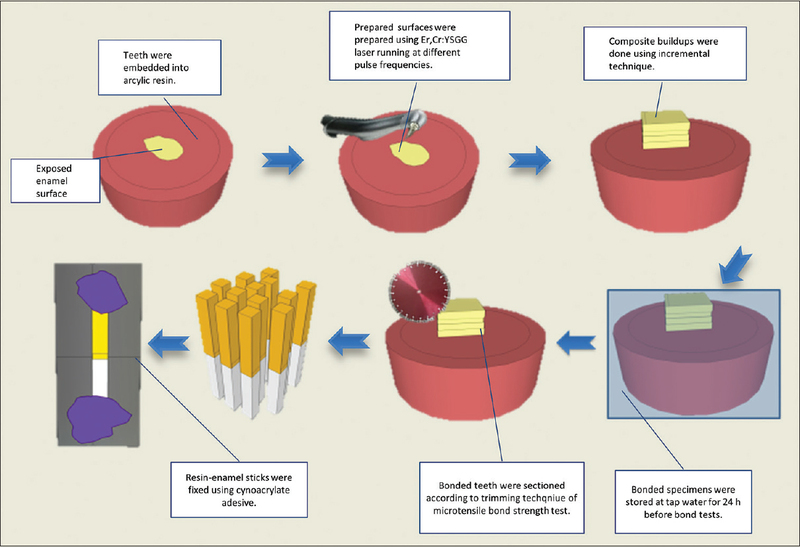 128 1-unit Co-Cr fixed dental prostheses were fabricated with four different techniques: Conventional lost wax method, milled wax with lost-wax method (MWLW), direct laser metal sintering (DLMS), and milled Co-Cr (MCo-Cr). The cement film thickness of the marginal and internal gaps was measured by an observer using a stereomicroscope after taking digital photos in ×24. Results: Best fit rates according to mean and standard deviations of all measurements was in DLMS both in premolar (65.84) and molar (58.38) models in μm. A significant difference was found DLMS and the rest of fabrication techniques (P < 0.05). No significant difference was found between MCo-CR and MWLW in all fabrication techniques both in premolar and molar models (P > 0.05). Conclusion: DMLS was best fitting fabrication techniques for single crown based on the results.The best fit was found in marginal; the larger gap was found in occlusal.All groups were within the clinically acceptable misfit range. Background and Objectives: Fibroepithelial lesions are the most common lesions of the breast seen in our laboratory consisting of fibroadenomas (FAs) and phyllodes tumors (PT). The aim of the study was to audit all fibroepithelial lesions and to reclassify all confirmed cases of PTs seen in the study period according to standard criteria. 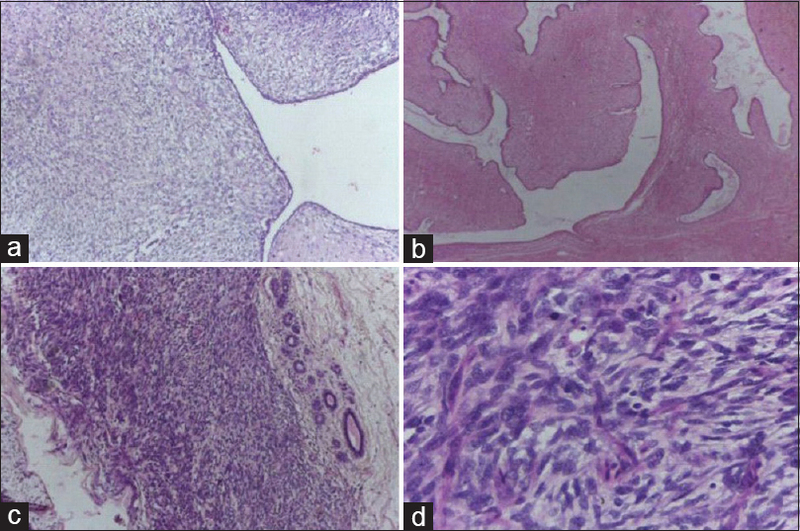 Methodology: Records and slides of fibroepithelial lesions of the breast received at the department between January 2008 and December 2013 were retrieved and reviewed by the authors. Results: Out of the 1242 fibroepithelial lesions of the breast retrieved, all but 19 were FAs. The 19 were initially reported as PT: 11 benign, 2 borderlines, 2 malignant, and 4 not classified; however, only 16 of these 19, PTs (84%) met the WHO criteria on review. The remaining 3 (16%) turned out to be FAs based on the absence of stroma overgrowth and hypercellularity. The PTs were reclassified into benign PT, borderline PT, and malignant PT accounting for 75% (12/16), 18.7% (3/16), and 6.3% (1/16), respectively. All of the PTs previously not classified turned out benign on review. One of the borderline PTs was originally reported as malignant PT. All cases initially diagnosed as FAs did not change on review. Conclusion: These results show that FAs are rarely misdiagnosed. The three cases misdiagnosed as phyllodes may have been prevented if standard data sets were in use. Cases simply referred to as PT without further classification, limit the patients' access to appropriate management as accurate classification helps in the overall management and prognostication. Aim: To assess the prevalence of primary hypertension and its correlation with anthropometric indices among a population of Nigerian adolescents. Materials and Methods: A cross-sectional study of secondary school adolescents aged 10–19 years in Enugu, Nigeria, using multi-staged sampling method. Anthropometry and blood pressures were measured using standardized instruments. Data analysis was with the Statistical Package for Social Sciences (SPSS) Version 20.0 (Chicago, IL, USA). Results: A total of 2419 adolescents (mean age, 14.80 ± 2.07 years) were included in the study. Prevalence of hypertension was 10.7%. Systolic and diastolic hypertension were observed in 232 (9.6%) and 85 (3.5%) of the participants, respectively. Forty-two of the 137 obese (30.7%) compared to 158 among the 1777 (7.7%) with normal body mass index (BMI) (P < 0.001) had systolic hypertension. Waist circumference (r = 0.37) and BMI (r = 0.37) significantly and positively correlated with systolic hypertension. Conclusion: Obese and overweight adolescents had higher prevalence of primary hypertension than their counterparts with normal BMI. Objectives: It is hypothesized that soccer players with periodontal disease exhibit raised serum creatine kinase (CK) levels as compared to those without periodontal disease. We assessed the clinical gingival status and serum CK levels among young soccer players. Materials and Methods: Demographic data were collected through a structured questionnaire. Full mouth bleeding on probing (BOP) and probing pocket depth (PPD) were assessed. Blood samples (4 mL) were collected for measurement of serum CK levels. All blood samples were collected from a vein in the antecubital region. Total CK activities in serum were determined with an optimized spectrophotometric method. Statistical analysis was performed using one-way analysis of variance, and P< 0.05 was considered statistically significant. Results: Twenty-seven male soccer players volunteered to participate in the present study. The mean age of the participants in Groups 1 (n = 14) and 2 (n = 13) were 18.2 ± 2.3 years and 19.1 ± 0.6 years, respectively. Mean scores of BOP were significantly higher among individuals in Group 2 (56.8%) compared with individuals in Group 1 (19.4%) (P < 0.001). Mean scores of PPD ≥4 mm were significantly higher among subjects in Group 2 (12.1%) as compared to individuals in Group 1 (0.8%) (P < 0.001). Levels of CK were significantly higher among individuals in Group 2 (292.7 U/L) as compared to those in Group 1 (52.3 U/L) (P < 0.01). Conclusion: Increased BOP and PPD are associated with increased serum CK levels in young soccer players. Background: Hypertension is a major public health problem worldwide. Estimating the prevalence of disease in populations of Nigeria would be useful in developing intervention programs to control it and prevent its consequences. Objective: This survey was carried out to assess the prevalence, awareness, treatment, detection and risk factors of hypertension in three major populations - Onitsha, Nnewi and Awka cities of Anambra State. Methods: The study was a church based cross sectional study involving 912 participants randomly selected from the three major zones in Anambra State. The age range of the participants was 17-79 years. Participants were administered with a well-structured questionnaire and their blood pressures (BP) as well as anthropometric measurements were taken using standard instruments. Results: The study population (n = 912) consists, 476 (52.16%) females and 436 (47.81%) males; sampled randomly from Awka, Onitsha and Nnewi. The overall crude prevalence of hypertension and prehypertension in the study population were 22.81% and 42.54% respectively. 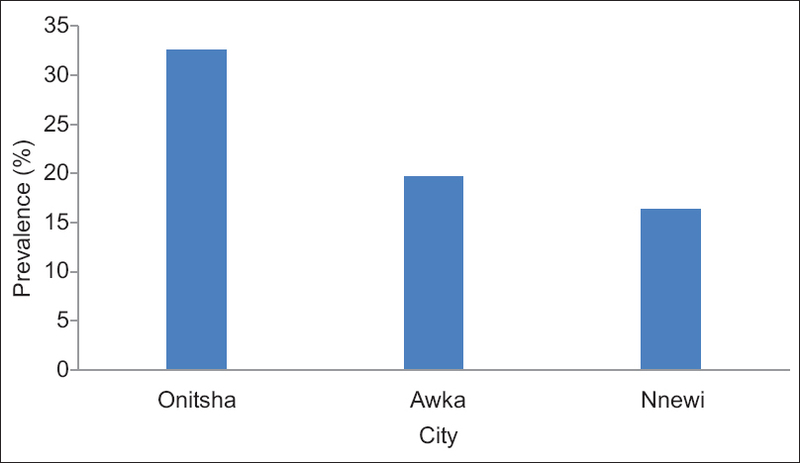 The crude prevalence of hypertension in the three cities - Onitsha, Awka and Nnewi were 32.56%, 19.665 and 16.40% respectively. The prevalence of hypertension was significantly higher in Onitsha (P = 0.0001). The prevalence of hypertension in both sexes was not statistically different (male, 22.01% and female, 23.5% P = 0.587). Mean BMI, Systolic, and Diastolic BP for the study population was 25.43 ± 4.2, 120.7 ± 18.39 and 78.21 ± 12.57 respectively. Systolic and diastolic BP correlated with age and anthropometric measures such as waist circumference, BMI, Hip circumference, weight and height. The following factors were strongly associated with the prevalence of hypertension in our study population: Age (χ2 = 110.87, P = 0.000); Zone (χ2 = 25.19, P = 0.000); BMI (χ2 = 45.51, P = 0.000); Physical Activity(χ2 = 58.08, P = 0.000); Alcohol Consumption (χ2 = 32.27, P = 0.000); Smoking (χ2 = 7.892, P = 0.000); General Health status (χ2 = 46,62, P= 0.000); Consumption of fatty food (χ2 = 29.35, P = 0.000). A low percentage of the population, 9.76% reported previous diagnosis of high BP and 34.59% of 910 of the participants also reported previous BP diagnosis of any relative. Our result shows that the prevalence of hypertension and prehypertension in this population was high and associated with some modifiable risk factors. In addition, poor detection, treatment and control of hypertension in this population were observed. This underscores the need for comprehensive evaluation of the prevalence of hypertension and other cardiovascular diseases in Nigeria. Introduction: Hypertension has been reported as the strongest modifiable risk factor for cardiovascular morbidity and mortality. Aims: The aim of the study was to identify the most prescribed antihypertensive drugs, its patterns, comorbidities, cost of medications, and laboratory investigations. 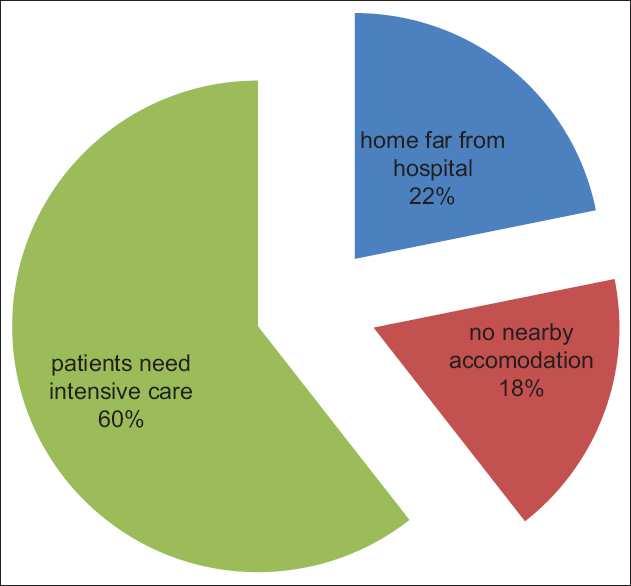 Settings and Design: This study was a cross-sectional, descriptive study of hypertensive patients conducted at the Lagos State University Teaching Hospital, Ikeja. Subjects and Methods: A total of 200 case notes were retrieved from the medical records unit over a period of 8 weeks. Information on antihypertensive prescriptions and comorbidities was retrieved. The average cost of medications and laboratory investigations was calculated. Statistical Analysis Tool Used: SPSS software version 16. Results: The mean age of the patients was 58.44 ± 12.65 years. Of the 200 patients, 5 (2.5%) were on monotherapy and 195 (97.5%) were on combination therapy. One hundred and twenty (60%) patients had comorbidities which included congestive heart failure 55 (27.5%), diabetes mellitus 22 (11%), hyperlipidemia 15 (7.5%), and cardiovascular disease 13 (6.5%). The various classes of antihypertensive drugs prescribed were diuretics 128 (64.0%), beta-blockers 126 (63.0%), calcium channel blockers 106 (53.0%), angiotensin-converting enzymes inhibitors 103 (51.5%), angiotensin receptor blockers 33 (16.5%), alpha blockers 9 (4.5%), and fixed drug combinations 2 (1.0%). The average cost per month of the antihypertensive medications was ₦ 2045 (US$10.2). Conclusions: Antihypertensive prescription pattern was in accordance with the seventh report of Joint National Committee on Prevention, Detection, Evaluation, and Treatment of high blood pressure. Community-based insurance scheme should be encouraged and effective implementation of integrated noncommunicable diseases screening into the primary health care services would be helpful. Aim: The purpose of this study is to use cone-beam computed tomography (CBCT) to describe the prevalence of apical health, the quality of root canal filling, and coronal restorations of endodontically treated teeth in the east Anatolian subpopulation of Turkey. Materials and Methods: CBCT scans were taken from 748 patients attending for the 1st time to the clinic at the Oral Diagnosis and Radiology Department at Ataturk University's Faculty of Dentistry in Erzurum, Turkey. All images were analyzed by two research assistants who were trained using examples of CBCT images with and without the presence of periapical radiolucency. The two examiners assessed images from the experiment independently, and the readings were then compared. All data were entered on an MS Excel 2007 spreadsheet and SPSS software 15.0 which was used for statistical analysis. The Chi-square test was used to determine if a patient's periapical status was associated with the technical quality of root filling, coronal status, and to evaluate differences between tooth subgroups. Results: In total, 147 teeth from 748 patients were found to have been treated endodontically. Sixty three teeth were found to have short root canal fillings, whereas 74 teeth had adequate root canal fillings, and the remaining 10 teeth had over extended root canal filling. A significant correlation was observed between the length of root filling and apical periodontitis (P = 0,023). Inadequately dense root canal filling was observed in 141 teeth, whereas adequately dense filling was found in only six teeth. There was a significant correlation between the density of root filling and apical periodontitis (P = 0.044). Coronal restoration was found in 90 teeth, but was not observed in all the three teeth. A crown was present in 54 teeth. There was a significant correlation between coronal restoration and apical periodontitis (P = 0.028). Conclusion: The results indicate that the quality of both the root filling and restoration were found to have impact on the periapical health of root-filled teeth. Schwannoma is a type of neurogenic tumor usually found in the posterior mediastinum. Most schwannomas range in size from 2 to 3 cm; some can exceed 10 cm. We herein report a case of a rare, large mediastinal schwannoma whose size is 20 cm × 15 cm × 12 cm, which has rarely reported before. Computed tomography scan showed a huge mass filling the lower right side of the chest and was compressing the right lower lobe of the lung. Subsequently, the tumor was completely resected using a right posterior lateral thoracotomy approach. The patient had an uneventful postoperative course and had done well since discharge from the hospital. 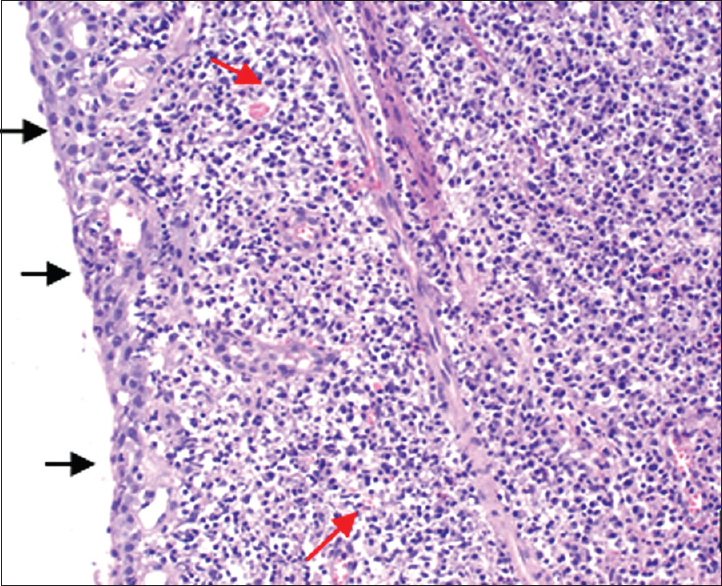 Pleomorphic adenoma (PA) is the most common benign salivary gland tumor, accounting for up to 60% of all tumors of the salivary gland and 75–80% of all parotid tumors. It has a slow but progressive growth pattern and if untreated can become greatly enlarged in size. However, giant PA is uncommon. 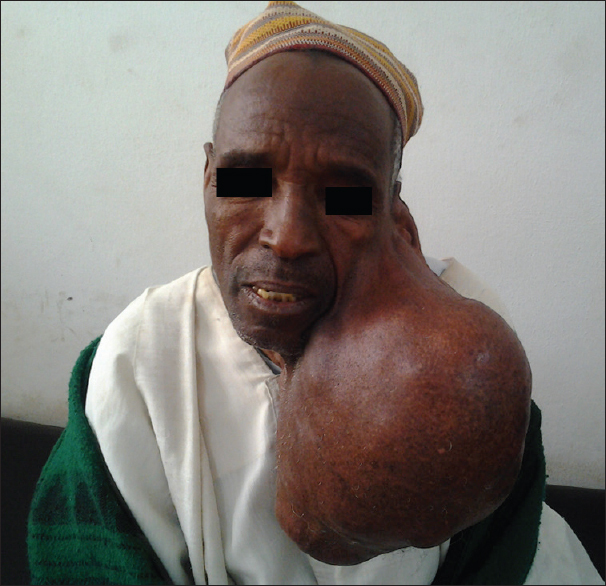 We report a case of giant parotid PA of more than 10 years duration in a 60-year-old male Nigerian. 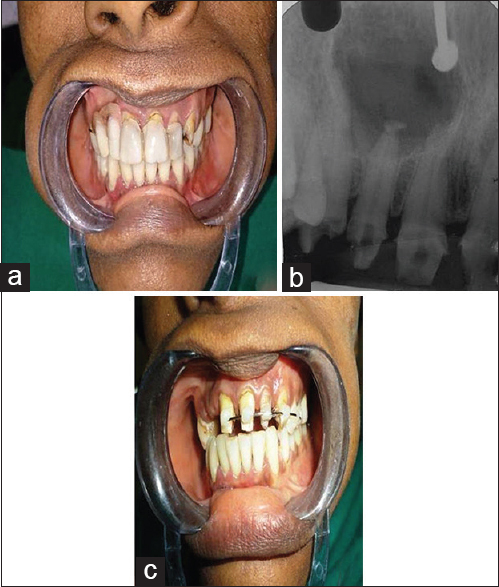 A 60-year-old male patient with 10-year history of painless, massive, and pedunculated swelling in the left side of lower face measuring 25 cm × 23 cm × 17 cm in dimension. Computerized tomographic scan and percutaneous fine needle aspiration cytology returned a preliminary diagnosis of PA. Superficial parotidectomy with facial nerve preservation via the transcervical approach was performed. The excised mass weighed 5.5 kg while the postoperative healing was satisfactory. Benign PAs may attain a giant size if left untreated. Socioeconomic problems are some of the reasons for late presentation. Adequate excision of the tumor sparing the facial nerve is possible but intraoperative and reactionary hemorrhage are likely complications. Prolactinomas are the most common pituitary tumors but rarely seen in adolescent males. There is no indication for surgery both in micro- and macro-adenomas unless an urgent treatment is necessary. First line treatment is always medical with dopamine agonists. In this report, we presented a patient with pubertal arrest and giant prolactinoma that disappeared in a short time with cabergoline treatment. Radicular cysts are inflammatory jaw cysts confined to the apices of teeth with infected and necrotic pulp. They arise from the epithelial residues in the periodontal ligament as a result of inflammation, following the death of pulp. The treatment of such lesions vary with regard to their sizes; the small cystic lesions heal after an endodontic therapy, but larger lesions, may require additional treatment. Apical surgery for radicular cysts generally involves apical root resection and sealing with endodontic material. This case report, describes the treatment of a cyst related to the maxillary central and lateral incisors using platelet rich fibrin along with synthetic nanocrystalline hydroxyapatite granules for the regeneration of lost tissues. A follow-up evaluation at 6 months and 1-year revealed a significant radiographic bone fill with satisfactory healing at the surgical site.